T1/E1 Clock Generator , By Cypress Semiconductor Corp. This is one package pinout of CY26200,If you need more pinouts please download CY26200's pdf datasheet. 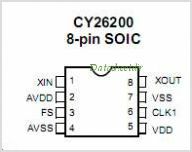 This is one application circuit of CY26200,If you need more circuits,please download CY26200's pdf datasheet.